Concentrate of hydration , formulated for all skin with intense dehydration. 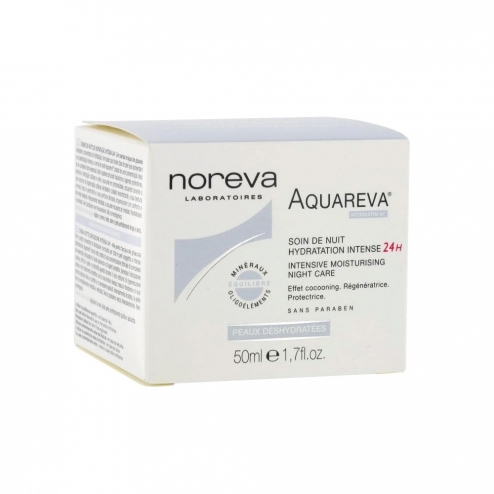 Aquareva night cream , with a concentration opimale hydro- essential complex hydro -sensor hyaluronic acid and protective agents , boost skin hydration , contact your skin deep acting during the night cycle of skin regeneration. Genuine care pampering, its creamy texture , fresh and tender , and delicate fragrance bring comfort absolute well-being. Intensely hydrated , your skin is , flexibility and softness. Apply in the evening on a perfectly clean, dry skin . Paraben-free, phenoxyethanol-free , not col�dog�ne ..